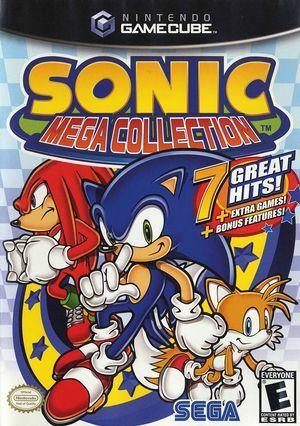 Sonic Mega Collection (ソニック メガコレクション Sonikku Mega Korekushon) is a video game compilation of Sonic the Hedgehog titles for the Nintendo GameCube It includes seven Sonic titles, all of the Sonic & Knuckles expansions/combinations, two bonus unlockable games, and a wide selection of bonus material. Due to a flaw in Dolphin's handling of the GameCube sample-rate, audio will slowly desync in this game. There is no solution currently. See issue 9235. When the game lags, it is possible that it will duplicate or show the wrong frames in the wrong order. 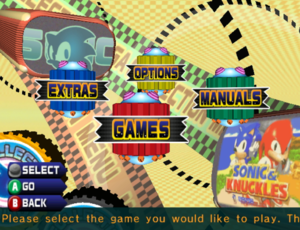 This is most evident in Blue Sphere, where it will happen when there are any number of spheres on the screen. In order to avoid this, enable "Emulated CPU Clock Override" and set it to 150% or higher. Refer issue 7199. 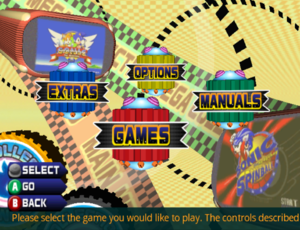 While playing through the 2D Sonic games, some visual oddities may be seen, for example: spikes spawning in out of nowhere, certain objects not rendering right away, or flickering on the Act 1/2/3 text. To fix these issues, set Texture Cache Accuracy to Position 1 (Safe), however this can cause reduced performance. The following Gecko codes adjust the horizontal FOV for widescreen support. The graph below charts the compatibility with Sonic Mega Collection since Dolphin's 2.0 release, listing revisions only where a compatibility change occurred. This page was last edited on 25 July 2018, at 03:50.